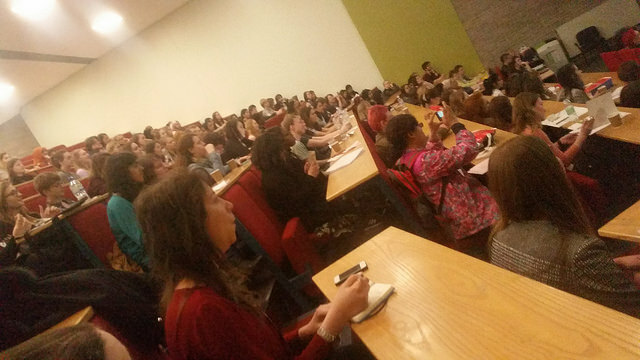 The 10th BCSWomen Lovelace Colloquium was held on April 12th, at Aberystwyth University. 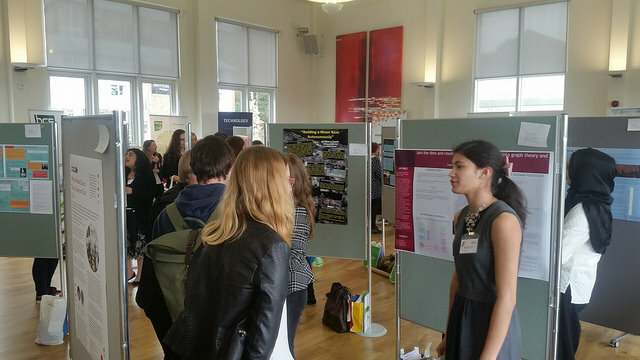 Around 200 attendees enjoyed a day of inspiring talks, fascinating student posters, careers advice, employers fair, lots of networking and too much cake. Our headline sponsor this year was Google, who covered loads of the student travel and also sent a speaker along. As we pay for travel for all the poster contest finalists and as we were in Aberystwyth this year, we paid for 2 nights for everyone. This enabled us to have a social the night before, with Scott Logic providing a hackathon activity which got people talking and coding (and eating pizza). 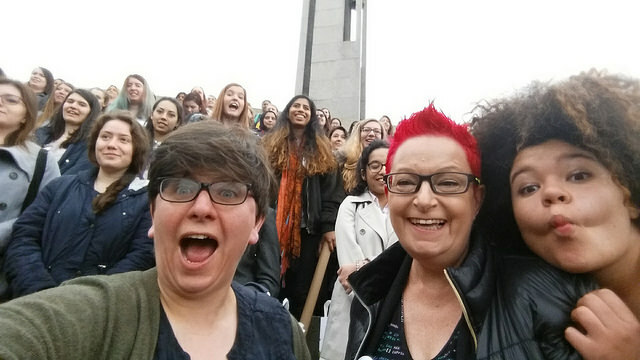 Our keynote was Dr Sue Black OBE, founder of BCSWomen and general awesome person, who talked about her life and career to date, with PhD, Bletchley Park, Stephen Fry and the Queen. At the end of Sue’s talk she actually had a queue of people waiting for selfies. Then we had Carrie Anne Philbin of Raspberry Pi, who gave a fab talk about using your powers for good. If you haven’t seen her yet check out her youtube channel. Unfortunately she had to dash off which was a shame as people were so inspired by her talk that they kept asking me where she was for pretty much the rest of the day. As usual the core of the day was an extended lunch and poster session. This year lunch was sponsored by GE, who also had a stand and helped out in lots of other ways. 2nd: Isabel Whistlecroft (Southampton) – Can algorithms emulate abstract art? Second year Emma James (Bath) – Can machine learning trump hate? Final year Rosie Hyde (Middlesex) – Can stress and anxiety be tracked through wearable technology? After the poster contest we had two more talks. The first was from Milka Horozova, of Google, who’s been in Google for just a few months. She met Google recruiters at the Lovelace in Edinburgh a few years ago so is a real Lovelace Colloquium success story. Our last speaker was Christine Zarges of Aberystwyth Computer Science, who talked about nature-inspired computing – artificial immune systems, neural networks, evolutionary systems. Interesting stuff. 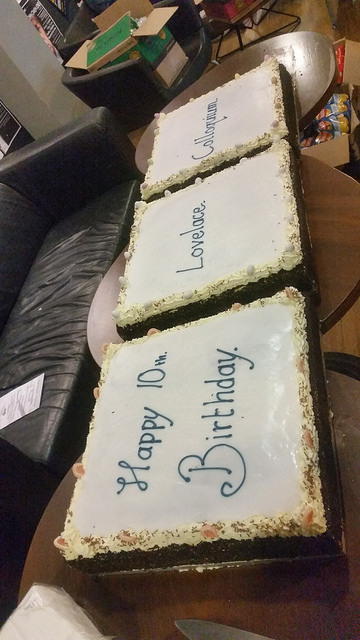 One cake break later (we have a lot of cake, thanks to our CAKE SPONSOR, Bloomberg – yes we have a cake sponsor) and we finished off with the panel session and prizegiving. On the panel was Dominika Bennani of JP Morgan, Carol Long from Warwick and a BCSWomen founder member, Milka Horozova from Google and Claire Knights from UTC Aerospace. And me. The idea of the panel is that all the students can ask any question they like, on anything to do with computing and computing careers, and it’s often my favourite part of the day. And then the last part of the day was the social, sponsored by ThoughtWorks – with more cake, and some drinks to help the networking go smoothly. This was my last event as chair: I started it in 2008, and have run it for 10 years, and now it’s time to pass it on. So at the end of the day I handed over to Helen Miles, who’s going to take the Lovelace forward (with me as deputy for a couple of years to ease the transition – I’m still going to be there, whatever!). Helen is also Aberystwyth, and has an office just downstairs from me, which makes the handover easy. Next year, we’re going to Sheffield. It sounds like another successsful event in the series. I hope you are properly proud of what you have achieved! Good luck with whatever new ventures you are embarking on.